Join us in the heart of Napa Valley for Sequoia Grove Winery’s educational Terroir Tasting with in-house wine expert, Lisa Thomas. 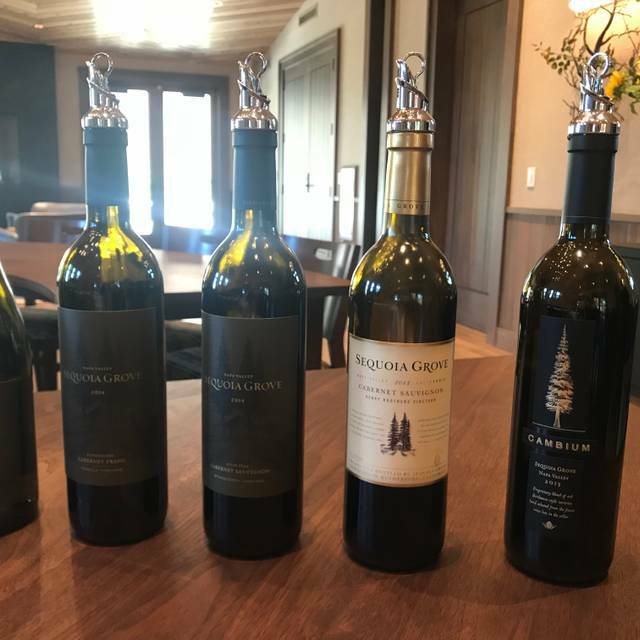 Learn the Sequoia Grove history, viticulture and winemaking practices and how the terroir of prominent Napa Valley AVAs is reflected in our wines. From there, you enjoy tasting vineyard-designate wines expertly paired with seasonal dishes. 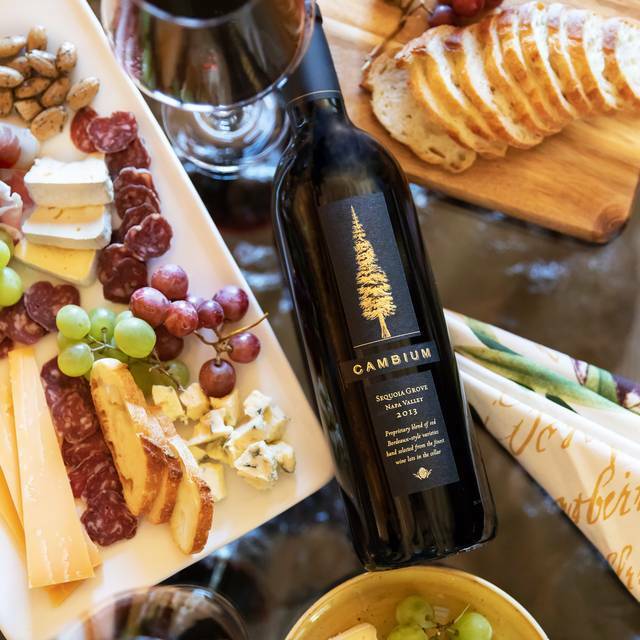 You’ll enjoy your intimate tasting experience with no more than 16 guests seated in our beautiful Cambium Room overlooking our grove of towering Sequoia trees. We offer one seating a day at 11 am and 2 pm, Thursday - Monday. Our Terroir Tasting experience $75 for Club Members and $95 for Non-Members for visits booked now. Please include your phone number when booking. 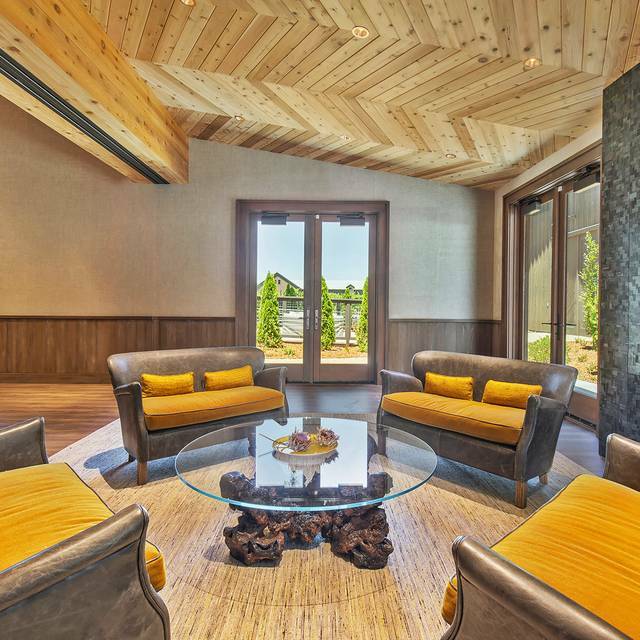 The ambiance of the winery is quiet, serene and well appointed. The staff is friendly, attentive and courteous; special kudos to Lisa as Maitre D'hotel and Mason as Majordomo. The Chef, Britny, created exquisite savory dishes which complemented the excellent choice of wines. My friends and I throughly enjoyed the whole experience. Many thanks and highly recommended. Lisa was a great guide and was very attentive. We 2 people together with a group of 14 and Lisa was able to make everyone feel special and answer lots of questions. The food and wine pairing was excellent. It was more than just a taste of food; it was 4 small courses-think tapas-that included duck and Osso Buco and a sweet treat at the end. The event space was nicely done. Highly recommended. Absolutely perfect and interesting pairings. The chef is innovative and the wines are classically delicious. She pulls out the nuances of each wine. Highly recommended! Especially if Lisa is your hostess!! Do not skip this one! Sequoia Grove has the best food and wine pairing! Wines and food are divine! Exceptional beginning to end, storytelling, unique food creations, atmosphere, setting and wine. A once in a lifetime experience. Worth every penny! 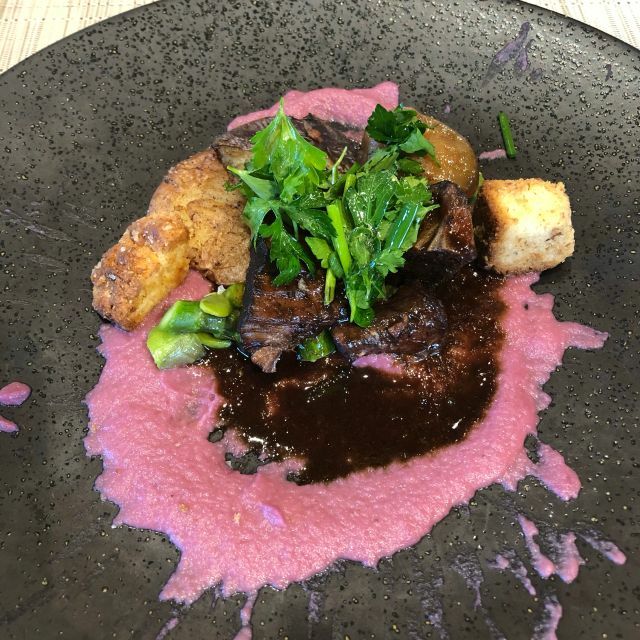 We were drawn to Sequoia Grove because of the online reviews of the food pairing, and we are so glad we went! It was the highlight of our four-day Napa trip and a memory we will have forever. We were lucky and actually got to dine with the wine maker herself, Molly, which was an incredible experience. Plus, the "tour guide" Lisa was personable, hilarious, and extremely knowledgeable. And to top it all off, the food prepared by Britny Maureze was perfectly paired with each glass of wine, eloquently bringing out the flavors. This all-female team are running an outstanding operation, and we were in awe the entire time. I highly recommend! I should note that they also created personalized menus, which had our names and even congratulated me and my husband on our 10 year anniversary. Plus, they accommodated my pescetarian diet with absolutely no issues. Amazing food and wine pairing! Excellent service and experience. Great venue Lisa was a great host and the food was excellent! I will be booking another pairing soon ! The wine tasting is also excellent !! 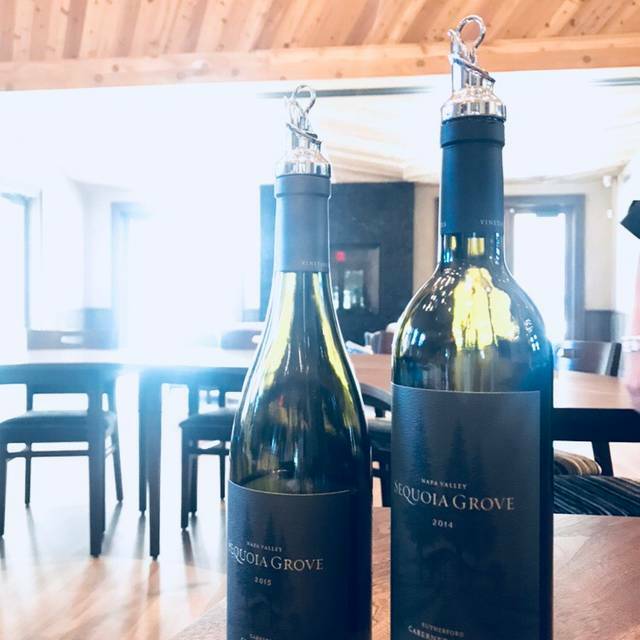 My husband and I celebrated our five year anniversary recently and chose Sequoia Grove for lunch because (1) I use to be a wine club member and love their wine; (2) it was rated top lunch site in the Bay Area; and (3) because I love a food and wine pairing. From the time we arrived at the winery, we were greeted by Lisa, who turned out to be our wine host for the lunch. SHE IS A GEM! FANTASTIC! AUTHENTIC! KNOWLEDGABLE AND ALL-AROUND EXCELLENT AT REPRESENTING SG! Chef Brittany is creating food on parallel with some of the top chefs in the region and I cannot wait for her cook book! We were joined by family members who were in our wedding party and each guest received a personalized menu. No detailed was spared and I'm still dreaming about the duck four ways! I almost hate to leave this review because I know it's going to be difficult to get a reservation once the word really gets out. OH AND THE WINE PAIRING IS EXCELLENT! I rejoined the wine club and can't wait to go back. Thank you Lisa and Chef Brittany for making our anniversary celebration memorable beyond our hopes. Phenomonal wine, food & education by Lisa! Loved it all!! 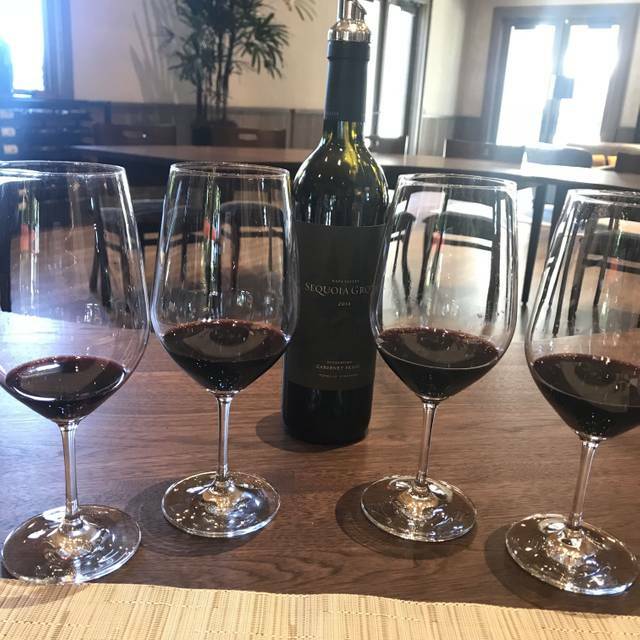 When I think back to our recent trip to Napa, our luncheon & wine pairing experience at Sequoia Grove was absolutely the highlight. If you're looking for a lunch spot during your Napa excursion, look no further! Well before we even left NYC for California, Lisa Thomas had reached out to make sure everything was expertly catered to our unique visit. The winery is a beautiful blend of rustic & modern, and the moment we walked in the door, Lisa was there to greet us with a huge smile and a stunning glass of wine. From there, the tasting & food pairing almost immediately began (even before we walked to the special dining room) with the most delightful pumpkin arancini. 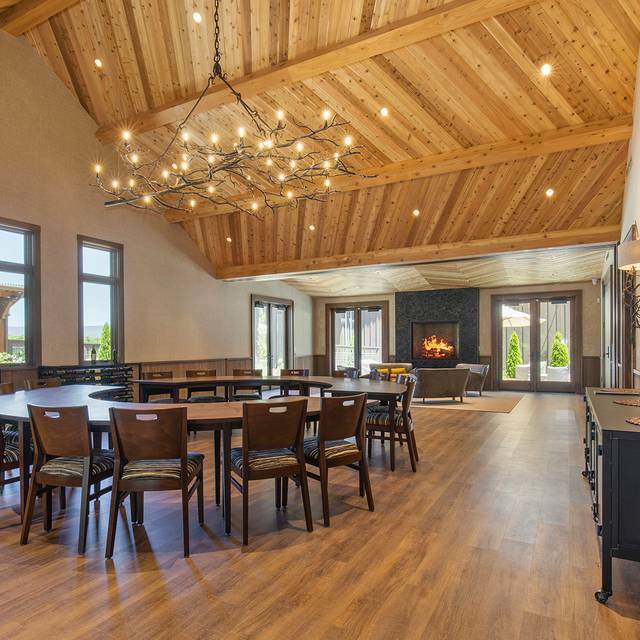 Following Lisa into our private tasting room, we were greeted with a lovely fireplace & massive round table -- perfectly setup to spark conversation & keep the entire experience informal & fun. Chef Britny Maureze introduced herself, and the four unique & absolutely delicious gourmet courses (the chef even prepared a very delicious vegetarian pairing for a member of our group) -- all highlighting the very special, very robust reds that Sequoia is known for. Paired with Lisa's extensive knowledge & incredible personality, our crew was smiling ear to ear throughout the entire experience. I've been so eager to tell everyone about this experience, and I can't wait to return to Sequoia with more friends in the near future. Seriously, just book your lunch with them now. You won't regret it! 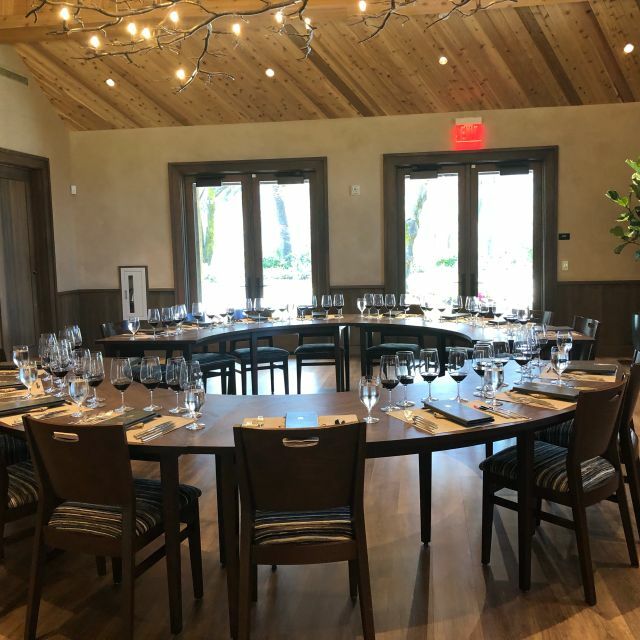 We loved the new room/building where the meal was served - a beautiful, special setting in Napa for a fantastic long lunch. The chef gave a brief overview of the menu to all, and Lisa (hospitality), was delightful in sharing information on the Sequoia wine pairings, including background on the vineyards and more. I appreciate the personal touches (names on menus) but most of all the delicious food and wine - courses with halibut, duck and short ribs- great with Cabernet Sauvignon. Can't wait to return with friends. Terrioir tasting was absolutely delightful. I can’t say enough about the quality of the wines, food, venue, and especially the service! We will absolutely be back. Joined the wine club so we can enjoy this fabulous wine more frequently and fondly remember our visit... can’t wait for our first shipment! The wine at Sequoia Grove is spectacular and their new Wine and Food pairing is amazing! I can't say enough. I highly recommend this experience to anyone visiting Napa. The experience itself is about an hour and a half so you can plan on being at the winery for at least 2hrs. Leave yourself time to decide which wines to order and take home with you. Finally, come with an appetite as you will leave feeling full, happy and satisfied. If you are in Napa don't miss this wonderful wine and food experience. The menu was wonderfully prepared to pair perfectly with the wines that were matched with each course. The vineyard-designated wines expertly paired so well with the seasonal dishes prepared by Chef Britny Maureze. Chef has a wonderful way of bringing out the best in the wine - and don't miss the gold boxed OMG so good salt brownies you get to take with you! Your host Lisa is amazing and makes the experience more than just your standard food and wine pairing She is a pro and would do it again just to hear her stories and learn more about the wine. Make sure you visit when Lisa is hosting and reserve early this is sure to sell out quick. A fabulous time. Should be a must for everyone traveling to Napa who loves food and wine! Birthday with friends from out of town! So good. I would recommend this experience for a person that likes wine tasting and not a regular lunch. Sitting in the round is nice for a sales pitch but not good for lunch for two. Great experience during our Napa Valentine/Anniversary trip! The wines were fabulous, and the education on how to pair with the wonderful food bits was fantastic. The food was fantastic, but having Cabernet first with fish, then vegetarian, then with a meat was so interesting. i also learned about the wine-making and vineyard process with my wonderful educator, LISA!!!! We enjoyed a wine tasting paired with an outstanding lunch. Lisa led us through the tasting giving us insights to each wine and how it matched up with Chef Britny's delightful small plates. Lisa was great! Fun and informative.The food was outstanding. We loved the pairings. Well worth a visit! Pairing was the Best I have ever had - in Napa or any area. Food was brilliant with the fantastic wines. What a gem! Our host (Lisa) was just fabulous, we became members and will be back. An amazing experience! The food was as plentiful as any tasting menu we have ever experienced, but, even better, It was also some of the tastiest. The multitude of different flavors in each dish perfectly highlighted the wine with which it was paired. We’ll definitely be doing this again as soon as we are in the area again. The staff was also very kind and extremely knowledgeable. Highly, highly recommended! Lisa is amazing!! The best food and wine pairing I have ever had!!! This is hands down the most bang for your buck regarding food and wine pairings. Our host Lisa (Sometimes Heather) was fabulous and was very knowledgeable. The wines were fantastic and paired wonderfully with each course. I believe for the price point, you wont find a food and wine experience that is this detailed and high quality. We had a wonderful experience. Lisa was our host, she explained everything we were tasting wonderfully. The food was amazing and we loved every wine. We will be ordering a case once we get home! Thank you for the wonderful experience. We would definitely do it again! Lisa and the food and wine pairing were amazing. Can’t say enough good things about the atmosphere, food, wine and service. Simply top-notch. Will refer to friends and we will be back! It was a memorable experience from start to finish. Great food/wine pairings with an excellent host, chef interaction in a small group setting. Note to vegetarians/Vegans: Please ask for a vegetarian tasting menu option and leave it in the chef's capable hands. The wine and food pairing is definitely a must! Our host Lisa was fantastic, starting with a brief introduction to the history of the winery. Group then settled into a fairly new building where the food pairing took place. Chef Britney was amazing. Food was beautifully presented, and paired perfectly with the wine. What an AMAZING experience. 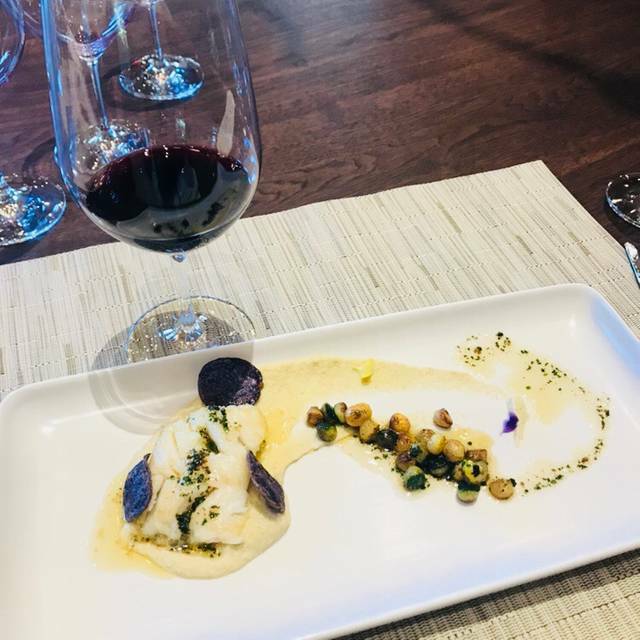 If you’re a foodie and love reds, the Chef’s Table wine pairing is a must! From the greeting when we arrived and the thoughtful care taken of every detail, we felt the experience was that one would expect at The Ritz. Our hostess Lisa rocked it out as she walked us through each course and pairing. Her passion and humor kept us very entertained. Nice addition Sequoia Grove and thanks again for a beautiful memory. Many thanks to Lisa for a very enjoyable experience. She was informative, accommodating, and entertaining. Lisa is an amazing host! The food paring was amazing as well as the wine! The Wine is always amazing there. Well......what can I say? Lisa is awesome, professional yet has a very friendly approach ! Wine is really good and yessss..the food....chef Britny is a “heaven sent” , sooner or later she will be a top notch chef..........and food enthusiasts will swarm her! We thoroughly enjoyed our tasting and wine pairing experience. Lisa Thomas was an awesome host, and made the experience light and entertaining. Britny Maureze was our outstanding Chef. The room for the tasting is beautiful, like sitting in a private room of a high end restaurant. The food was delicious, and just enough for a light lunch complete with excellent wine pairings that made the food and the wine each stand out when you tried together. Will return! Outstanding food, service and ambiance. Host was very knowledgeable on pairing information and history of Sequoia Grove.